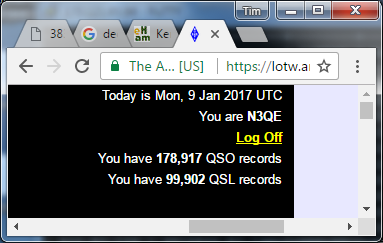 At lunchtime - 99,902 QSL's confirmed via LOTW. I think by tomorrow, as confirmations trickle in from this weekend's RTTY RU, I'll be over the magic 100,000! Pre-congrats on the 100k confirmed and closing in on 200k! E51Q and T2J QSL cards. Neither am I, maybe more contest might be a answer, after retiring in 2014 I thought my radio time would excel not the case? Congratulations Tim. A milestone. A45XR on 80 & 40m confirmed within hours via LoTW. New one on both bands. ZL9A - NEW ZEALAND SUBANTARCTIC ISLANDS - LOTW received (paper QSL received long ago). S9YY paper card for 80, 40, 30, and 10M CW! I don't expect many more 10M Challenge points with this solar cycle. Same here but for 20m CW! E6AC (September 2016) QSL card.